They face off across St. Petersburg’s Kryukov Canal, the twin peaks of Russia’s classical world—the mint green Mariinsky Theater, the historic pride of the tsars, and the sleek modernist glass of Mariinsky II, completed last year. Together, they are home to the opera and ballet that have produced some of history’s greatest singers and dancers: Fyodor Chaliapin and Anna Netrebko, Anna Pavlova and George Balanchine. After the ballet’s trip to London this summer, the opera is preparing for two upcoming sets of performances in the UK: a new staging of Berlioz’s epic “Les Troyens” by Yannis Kokkos at the Edinburgh International Festival on August 28-30, and a November series in London that will bring Mussorgsky’s classic “Boris Godunov,” the new comedic opera “The Lefthander” and an evening of Russian Orthodox church music to the Barbican. Today, the Mariinsky (known affectionately in Russian as the “Mariinka”) is one of the busiest arts institutions in the world. 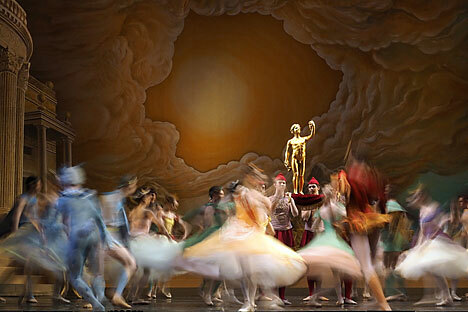 It premieres six or seven major new productions annually, compared with the Bolshoi’s typical two or three. It plays host to Petersburg’s annual Stars of the White Nights festival, which this year presented 118 works by companies from Russia and abroad. The institution first opened its doors in 1783 as the Bolshoi Stone Theater. In 1860, when it was rebuilt after a fire, it was rechristened the Mariinsky in honour of Maria Alexandrovna, the wife of Tsar Alexander II. Under the tsars, it was the social pantheon of the ruling class, frequented by the imperial family as well as luminaries such as poet Alexander Pushkin. In the latter half of the 19th century, the theater premiered ballets including “The Nutcracker,” “Swan Lake” and “Sleeping Beauty,” and operas such as “Boris Godunov” and “Prince Igor.” Under the leadership of Marius Pepita, it produced the canonical versions of ballets that would become the bedrock of classical repertoire all over the world. In the Soviet era, the Kirov (as it was renamed in the 1930s) continued to be lavished with official resources, and staged important versions of ballets and operas such as “Eugene Onegin” and “The Queen of Spades”—though it lost two its of its most celebrated dancers, Rudolf Nureyev and Mikhail Baryshnikov, to the West. The country’s collapse in the ‘90s hit the illustrious theater hard. Gergiev, the fiery young conductor from North Ossetia who took over as chief conductor in 1988, put it on a heavy touring schedule to keep it afloat. Gergiev brought a strong vision to the theater, reviving forgotten works by Rimsky-Korsakov and Prokofiev. He also recognised the importance of nurturing and promoting top talent; under his tenure, the Mariinsky has been home to star singers Netrebko and Olga Borodina, and prima ballerinas Diana Vishneva and Ulyana Lopatkina. Under Gergiev, the theater also began to expand. First came a new state of the art concert hall in 2007, which hosts everything from intimate solo performances to major events such as the orchestra’s upcoming performance of Britten’s “War Requiem” this September. With the backing of President Vladimir Putin, a close ally, Gergiev was also able to achieve his dream project: Mariinsky II, the gleaming 2,000-seat theater that cost over $700 million. Mariinsky II, which hosts both opera and ballet, eschews the royal chandeliers and gilding of its predecessor for a sleek wood auditorium and onyx wall, as well as windows that offer views over the canal (a bridge connects it to the old theatre across the water). Despite early snubs by the city’s intelligentsia, who derided what they considered its bland architecture, its crisp acoustics have earned enthusiastic reviews. The maestro, who carries four mobile phones, is legendary for his breakneck pace. In addition to overseeing all aspects of the Mariinsky, he conducts regularly at the Metropolitan Opera in New York and the London Symphony, among others, and is set to take over as musical director of the Munich Philharmonic next year. At the peak of the Mariinsky’s revival in the mid-90s to mid-2000s, then-ballet head Makhar Voziyev introduced work by William Forsythe and other contemporary choreographers, while on the opera side, Gergiev attracted daring young directors such as Dmitry Chernyakov and Kirill Serebrennikov. There are changes to come next year, when the historic theater is set to undergo renovation. Meanwhile, ballet stars Vishneva and Lopatkina are getting close to retirement age, clearing the stage for an up-and-coming generation of stars. Through it all, there will be the indomitable Gergiev, who at the age of 61 still has a long career ahead of him.